Wildlife CSI is a private wildlife consultancy that commenced operations in April 2004, offering wildlife conservation, management and research solutions and services to local, state and federal governments, private and public zoos and sanctuaries, non government organisations and private businesses. 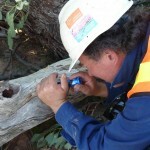 Sugarloaf Pipeline (John Holland) – Fauna Managers/Wildlife Specialists undertaking fauna salvage and relocation. This involved the monitoring of vegetation and top soil removal along the entire pipeline right of way (70 km), capturing, assessing, identifying and relocating fauna affected by the pipeline works. During the project, Wildlife CSI personnel dealt with several threatened species, for example, Striped Legless Lizard, Tuan (or Brush-tailed Phascogale, a small carnivorous marsupial) and Brown Froglet. Eastlink Freeway (Thiess/John Holland) – Fauna Managers/Monitors for the entire freeway alignment. Dealt with over 600 fauna species, many of which were relocated. Monitored tree and vegetation removal, wetland draining, installed artificial nest boxes, reunited fledgling and chicks with parents, maintained a fauna database, prepared fauna reports and provided on site operator induction to the likely fauna that may be encountered. Calder Freeway – Fauna Managers/Monitors for three sections of the Calder Freeway Project (Malmsbury/Taradale (FRH, now Fulton Hogan), Harcourt south (Winslow) and north (Thiess)). Captured and relocated fauna affected by tree and vegetation removal, identified Striped Legless Lizards (SLL) in atypical and unknown habitat (granitic soils) and participated in recovery measures for SLLs. Wildlife CSI captured and relocated Tuans (Brush-tailed Phascogale), possums and gliders, frogs, lizards, tortoises and snakes. Goldfields Super Pipe (EarthTech/Leeds)– Fauna Managers/Monitors for the Bendigo to Ballarat pipeline. Monitored tree and vegetation removal, salvaged blind snakes, other snakes, frogs (including tadpoles), lizards, monitored soil excavation for Pink-tailed Worm Lizards, inspected open trenches and undertook Powerful and Barking Owl call monitoring at dawn and dusk. 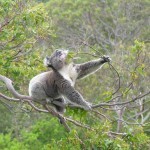 Peninsula Link Freeway (Abi Group) – Fauna Managers/Monitors for the entire freeway alignment. Dealt with over 600 fauna species, many of which were relocated. Monitored tree and vegetation removal, wetland draining, installed artificial nest boxes, reunited fledgling and chicks with parents, maintained a fauna database, prepared fauna reports and provided on site operator induction to the likely fauna that may be encountered. Vic Roads: various tree removal projects across Vic Roads northern region. Fauna Habitat Assessments, salvage and relocation. Southern Improvement Alliance: Donnybrook/Beveridge passing lane (Melbourne/Sydney rail line). Fauna salvage & translocation during construction; survey for Earless Dragon (a threatned species). Bass Highway duplication: Monitor tree and vegetation removal, salvage and relocate fauna. Timbercorp/Liparoo Vineyards/Sunraysia Estates: Murray River pump station and pipeline for almond and grape plantations. Fauna Habitat Assessment, salvage and relocation. Goulburn Valley Freeway: Cut and Fill; Fauna Habitat Assessment, salvage and relocation. Nagambie Bypass: Abi Group; Fauna Habitat Assessment, salvage and relocation. 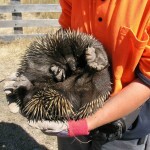 Melbourne Geelong Pipeline: Abi Group; Fauna salvage and relocation. 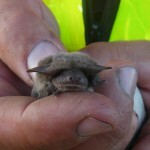 Bendigo Mining: Fauna Habitat Assessment, salvage and relocation. Hillview Quarries, Dromana: Fauna Habitat Assessment, salvage and relocation. Regional Rail Link Project (John Holland alliance & Biosis Research): Growling Grass Frog habitat assessment and Striped Legless Lizard salvage; general fauna salvage and relocation. City West Water: Altona Treatment Plant and Laverton Pipeline: fauna habitat assessments, salvage and relocation.